So how does it work? 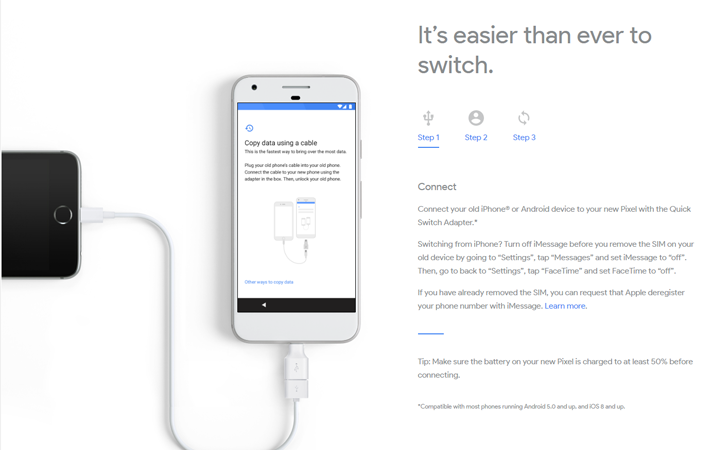 Simply connect the adapter to your Pixel, and plug your old phone's charging/data cable into it. Once you are signed in with your Google account, you can choose what data to copy. Contacts, calendar events, photos, videos, music, iMessages, SMS messages, and more can all be transferred automatically. Android 7.0 already has a similar migration tool, but requires a bit more effort. Transferring data from an old Android device is achieved through NFC, and iOS users are required to upload all the data themselves from their old device. It remains to be seen if this tool will be made available as part of Android 7.1, or if it will remain a Pixel-only feature.